Following the conclusion of the last event of 2016 on either of the major tours in Hong Kong today, the statistics for the 2016 GP season are now available on Golf Predictor (Other Stats menu, Season Stats options). The numbers have been crunched for all 542 golfers who played at least five tournaments (excluding non-finishes) on the European/US PGA Tour during the course of the GP season (2016 calendar year). This year, I have listed the best golfers in various categories. In each case, only golfers who played at least fifteen tournaments across both tours in 2016 are included in the analysis. An unsurprising list, with the possible exception of Scott, but even he won twice earlier in the year. As you can see, Scott had an impressively low standard deviation, which means he finished consistently very high up the leaderboard all year. This can be seen in his results, where his worst results were a couple of finishes in the 50s. No surprise that most of these golfers have featured in previous lists! However, the great end to the season for Noren sees him make his only appearance on this page in first place. Once again, no surprise that most of these golfers have featured in previous lists! Note Matt Kuchar had eleven top tens, but he played 28 tournaments which gives him a lower percentage. Also, several other golfers also had ten top tens, but from more tournaments. Another impressive 2016 stat for Scott, who is the only golfer who played more than six events to have made every cut this season. As you can see, US PGA Tour golfers feature very heavily in this list! As you can see. all the golfers above have very similar stroke averages, especially those ranked second to fifth. No surprise that most lists contains the same golfers, given the interrelated nature of the lists. See these and many more interesting 2016 GP season statistics on Golf Predictor! Sam Brazel (ranked 77th by Golf Predictor) won the UBS Hong Kong Open on the European PGA Tour. The 37 year old Australian finally won his first tour title in an exciting finish in Hong Kong. At one point, there were six tied for the lead on the back nine and although Brazel pulled away, he was caught by long time leader Rafa Cabrera Bello after the Spaniard birdied the sixteenth and seventeenth holes. However, the Australian was not to be denied, as he hit his second shot close (with a slight mis-hit, as he admitted afterwards!) on the last to set up the winning birdie. Our top ranked player, Patrick Reed, didn't really feature and finished in T43rd. Overall, we had ten of the top fourteen plus ties (10/24) in total. The predictions and statistics for this week, the UBS Hong Kong Open (European PGA Tour), are now available on Golf Predictor. It's the last event of the long GP Season and like last year, there are several big names playing in Hong Kong Open this year. It's not hard to guess what brings the likes of Justin Rose, Danny Willett and Patrick Reed half way around the world in December! Rose pulled out of the Hero Challenge in the Bahamas a few days ago with a bad back, so you might want to factor that into your deliberations this week. Brandon Stone (ranked 9th by Golf Predictor) won the Alfred Dunhill Championship on the European PGA Tour. The 23 year old South African won his second tour title (and second in his home country) with an impressive performance at Leopard Creek. Leading going into the final day, Stone was caught on the front nine by a fast starting Charl Schwartzel. However, event specialist Schwartzel fell away badly on the home stretch and Stone saw out the win easily, winning by seven shots in the end. Schwartzel was our top ranked golfer and still finished in tied 4th, despite that surprising meltdown. In an event that is usually difficult to predict, we had ten of the top seventeen plus ties (10/19) in total. Harold Varner III (ranked 9th by Golf Predictor) won the Australian PGA Championship on the European PGA Tour. The American won his maiden European tour title in an exciting battle down the stretch with long time leader Andrew Dodt. Varner, who co-led after the third round here last year but lost in a play-off, came from two shots back this time with a closing 65 to win by two himself in testing conditions on the Gold Coast. Our top ranked golfer, Adam Scott, finished third and despite the weather and limited history in the system, we had eight of the top fifteen plus ties (8/20) in total. There was no official event on the US PGA Tour this week! Golf Predictor doesn't cover the (very) restricted field junket that is the Hero Challenge, even if Tiger Woods made his latest comeback there! 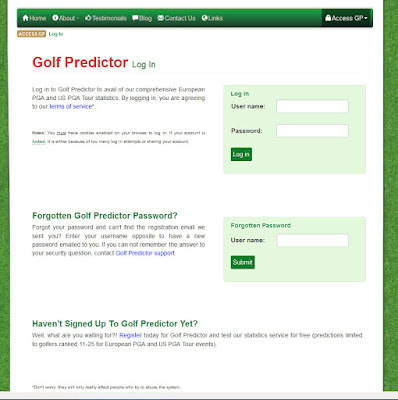 The log in and log out pages on Golf Predictor have been improved. Similar to the fairly recent changes to other site elements, these pages have been enhanced with more attractive Twitter Bootstrap components. This can be seen in the screenshots above, which show the old and new log in pages. As you can see, the two column layout with green panels have been replaced with an attractive new Bootstrap panel with snazzier fields and effects! This new look is much cleaner, with the Forgotten Password functionality now accessible via the link on the right hand side of the panel header. Clicking this link will change the panel displayed to the Forgotten Password one, which in turn has a link back to the log in panel in the same location. The much simpler log out page has been updated in a similar manner. The message on this page has been simplified and displayed in an attractive Bootstrap panel. Both these newly updated pages should work fine on any size screen from mobile phone up to a large monitor. I have tested these updated pages on several browsers and all appears to work as expected. Please contact me immediately if you experience any problems logging in or recovering your password. I trust you will agree that these cosmetic updates to the log in and log out pages are an improvement. Just another way to make Golf Predictor a little better! The predictions and statistics for this week, the Alfred Dunhill Championship (European PGA Tour) and the Australian PGA Championship (European PGA Tour), are now available on Golf Predictor. It's the first week of the 2017 European Tour, even though it's still 2016 and of course, it's not in Europe! Like previous years, there is a strong South African contingent, including multiple champion Charl Schwartzel and world number sixteen Branden Grace. While this marks the second year that the Australian PGA has been on the European Tour (and hence on Golf Predictor), it has a long history, dating all the way back to 1905. However, only the tournament history for when it has been part of the European Tour (i.e. last year) is available in Golf Predictor, so please factor that into your analysis. There is no event on the US PGA Tour this week, except for Tiger's invitational junket (Hero World Challenge). As in previous years, Golf Predictor is not not covering that (very) restricted field event. All eyes will be on the Bahamas though, where the host makes his latest comeback! McKenzie Hughes (ranked 118th by Golf Predictor) won The RSM Classic on the US PGA Tour. The 25 year old Canadian rookie won his first PGA Tour title in a five man play-off in Georgia. All five had birdie putts on the first extra hole, but Billy Horschel missed a tiddler for par and was eliminated. The four remaining golfers parred the next and came back on Monday to finish up. Despite missing the green with his first two shots, Hughes holed his par putt on the par three from just off the green to put pressure on his opponents, Blayne Barber, Camilo Villegas and Henrik Norlander. After the trio missed progressively shorter putts, long time leader Hughes took the title. Our top ranked player, Matt Kuchar, uncharacteristically missed the cut and in an event that's usually hard to predict, we had seven of the top thirteen plus ties (7/20) overall. The predictions/statistics for this week, the DP World Tour Championship, Dubai (European PGA Tour) and The RSM Classic (US PGA Tour), are now available on Golf Predictor. It's the last event of the season (but not the year!) on the European PGA Tour and the last event of the year (but not the season!) on the US Tour! Although Rory McIlroy is again in the running for the Race to Dubai heading into the season finale, this year he only has a remote mathematical chance of winning the title. That is more likely to go to Henrik Stenson, Danny Willett or the on fire Alex Noren. The field is more modest in Georgia, where it will be the last chance before January to put some FedEx Cup points on the board. Alex Noren (ranked 3rd by Golf Predictor) won the Nedbank Golf Challenge on the European PGA Tour. The 34 old Swede continued his rich vein of form by winning his fourth tour title in his last eleven starts. Despite trailing overnight by six shots, Noren blitzed the field with a stunning closing 63 (-9) on the tough Sun City layout to win by six shots in the end. Our top ranked golfer, Henrik Stenson, finished in eighth place and, despite a good weekend from Danny Willett, increased his lead in the battle for the Race to Dubai. Overall, we had ten of the top sixteen plus ties (10/19) in total. Pat Perez (ranked 79th by Golf Predictor) won the OHL Classic at Mayakoba on the US PGA Tour. The 40 year old American won his second tour title by two shots in Mexico. Perez put his recent shoulder injury woes behind him with his first win on the US PGA Tour in over seven years. No one put the hot headed American under any pressure on the back nine, despite him seeming to lose his cool on a couple of occasions. Our top ranked player, Russell Knox, finished in third place and in an event plagued by weather delays and which is usually hard to predict, we only had nine of the top fifteen plus ties (9/23*). * Withdrawals promote Vegas into the top 23 of the GP rankings. The predictions and statistics for this week, the Nedbank Golf Challenge (European PGA Tour) and the OHL Classic at Mayakoba (US PGA Tour), are now available on Golf Predictor. Race to Dubai leader Henrik Stenson will be hoping to fend off nearest challenger Danny Willet in South Africa. That shouldn't be too difficult, given how the Englishman has been playing recently! Meanwhile, except for Russell Knox and Jim Furyk perhaps, it's the usual second string line up for the Mexican tournament this year. Thorbjorn Olesen (ranked 31st by Golf Predictor) won the Turkish Airlines Open on the European PGA Tour. The 26 year old Dane overcame recent poor form to win his fourth and biggest title in Turkey. Olesen built up a huge seven shot lead going into Sunday, helped in no small part by a course record 62 (-9) on Friday. However, he didn't have it all his own way on the final day and his lead was cut to a single shot after a mid round wobble. However, he managed to steady the ship to win by three shots in the end. Our top ranked player, Danny Willett, had another poor week and finished in tied 68th. Overall, despite the great playing conditions, not many of the bigger names played well and we had eight of the top seventeen plus ties (8/21). Rod Pampling (ranked 118th by Golf Predictor) won the Shriners Hospitals for Children Open on the US PGA Tour. The 47 year old Australian won his third tour title and first for ten years with an unexpected victory in Las Vegas. Pampling opened up with a 60 (-11), narrowly missing a twelve foot foot putt on the last for a 59. Although he was subsequently overtaken, he came fighting back on the final day. In a tense battle with Lucas Glover and Brooks Koepka, Pampling held his nerve down the stretch with a strong finish to win by two shots. Our top ranked player, Jimmy Walker, had another poor week and missed the cut. Overall, we had only six of the top fifteen plus ties (6/23), in an event where many of the lesser lights came to the fore. The predictions and statistics for this week, the Turkish Airlines Open (European PGA Tour) and the Shriners Hospitals for Children Open (US PGA Tour), are now available on Golf Predictor. The European Tour heads back to Turkey for the fist leg of the big money Final Series and it's on a new course this year. Although Rory McIlroy is one of those withdrawals due to security concerns, Masters champion Danny Willett will be hoping to steal a march on the Northern Irishman and Henrik Stenson for the Race to Dubai title. Meanwhile, the Las Vegas event on the US PGA Tour hasn't got many big names competing in it this year. However, they do have reigning US PGA champion Jimmy Walker, who'll be hoping to play better than he did last week in China! Hideki Matsuyama (ranked 10th by Golf Predictor) won the WGC - HSBC Champions on the European/US PGA Tour. The 24 year old became the first Japanese winner of a WGC title with a dominating performance in Shanghai. Matsuyama kept his recent good form going by romping to a seven shot victory over a quality field. The Japanese sensation went bogey free on his final 45 holes, despite finding water on the seventy second hole! Our top ranked player, Rory McIlroy, finished strongly for tied 4th place and we had ten of the top sixteen plus ties (10/18) in total. Cody Gribble (ranked 68th by Golf Predictor) won the Sanderson Farms Championship on the US PGA Tour. The 26 year old American became the first rookie winner in the new wraparound season, winning what was only his eighth event on the main tour. Gribble won in some style, playing some incredible golf down the stretch to win by four shots on -20. Our top ranked player, Chris Kirk, finished in tied 2nd and we had only eight of the top eighteen plus ties (8/22) in an event that is traditionally hard to call. 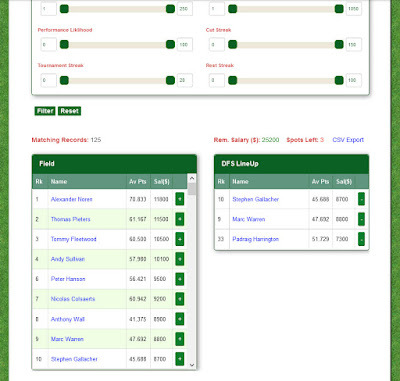 I am very happy to announce the addition of a great new 'DFS Lineup Builder' page to Golf Predictor. As can be glimpsed in the screenshot above, this new page is similar to the existing 'Filtered Prediction Rankings' page and is available from the same 'Predictions' menu in the Member section. 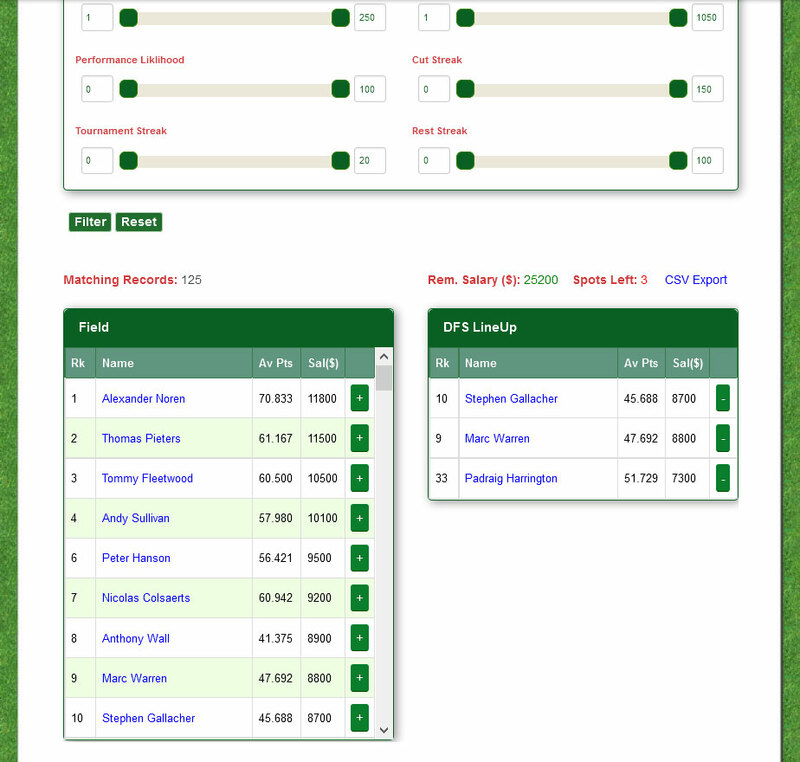 However, while the 'Filtered Prediction Rankings' page simply allows you to identify golfers with certain statistics of your choosing, this new page goes further by allowing you to create a DFS lineup that you can export to DraftKings. In summary, this new page is a combination of the Filtered Prediction Rankings page on Golf Predictor and the Lineup Creator page on DraftKings! The sliders are the same on this new page as those on the 'Filtered Prediction Rankings' page, but the columns on the data table have been altered to contain just DFS data from DraftKings (i.e. salary, rank and average points per game). This can be seen in the screenshot above for the 2016 Portugal Masters, which has no filters actually applied so it shows the entire field. Some of the sliders are shown, as is the narrower data table containing the (filtered) field with DFS data underneath on the left. Pressing the "+" button on a row will transfer that golfer to the lineup table on the right. Conversely, pressing the "-" button on a row on the lineup table will remove that golfer from your lineup. Your remaining salary and number of golfers remaining will be automatically updated as you add and remove golfers and displayed above the lineup table. You can also export your completed lineup in a DraftKings compatible CSV file via the link above the lineup table. To keep things manageable, there is no sorting or paging on the (filtered) field DFS data table (left hand side above) on this new page. Instead, similar to DraftKings, the entire field is displayed in a single table with a scroll bar. Due to the absence of sorting, the golfer names are displayed in both tables using the Firstname Lastname format. If necessary, you can search for a golfer using your browser search box. The 'Remaining Salary' and 'Spots Left' value labels above the lineup table are colour coded to assist you (see screenshot above). If you stay under the salary cap, the label will be green, but if you exceed the cap, it will be red. Finally, when you have exactly $0 left, the label will be black. Similarly, while you have golfers left to pick, the 'Spots Left' label will be red and when you have selected the required number (6), it will change to green. In short, while either of these labels are red, you cannot export your lineup to a CSV file. You can't add more than six golfers to the lineup table. You will get a pop-up message to that effect if you try. Adding a golfer to the DFS Lineup table doesn't remove him from the (filtered) field table (LHS). However, you can't add the same golfer more than once to the lineup table. You will get a pop-up message to that effect if you try. As alluded to above, you can't export your lineup to a DraftKings compatible CSV file unless you stay under the salary cap of $50,000. You will get a pop-up message to that effect if you try. As also alluded to above, you can't export your lineup to a DraftKings compatible CSV file unless you have selected six golfers. You will get a pop-up message to that effect if you try. The exported file is a CSV file that is designed to be compatible with DraftKings and imported into their site using their Upload Lineups tool. To facilitate this, I now also import the player DraftKings player IDs for the tournament. The CSV file export may not work on IE 9 (or earlier) browser. I have tested it on IE11 in IE 9 compatibility mode and it works fine. If you still use IE 9, it really is long past time to upgrade to a decent browser! If you edit the exported CSV file, it may not upload to DraftKings correctly. For example, DraftKings seems to need two blank lines at the end of the file before it will upload it. Therefore, please do not remove these lines from the CSV file! Please check your uploaded lineup on DraftKings to make sure it contains the golfers you selected*. The DraftKings IDs for a tournament have to sourced from a text file on the DraftKings Lineup Upload page, which is different to the text file that is already used on Golf Predictor to import the DraftKings stats. I have asked DraftKings to include the IDs on this text file (downloadable from the Draft Team page) and have received a very positive reply. Until that happens, I have to rely on both text files having the same golfers in the same order, which has been the case so far in my experience. If I cannot source the tournament player IDs for whatever reason, you will not be able to export your lineup to a DraftKings compatible CSV file. This is because DraftKings only accepts player IDs and not their names. Only golfers with DFS information (i.e. on the DraftKings list) are shown on the (filtered) field DFS data table (LHS). Since typically not all golfers in the field are on the DraftKings list, the missing ones will not be visible on this page. Your filtered rankings and DraftKings lineup are just displayed on this page and not saved. This means that if you were to click on a link as usual (e.g. to a golfer prediction data page) and return to this page via the browser's Back button, your filtered rankings and lineup choices will be lost. 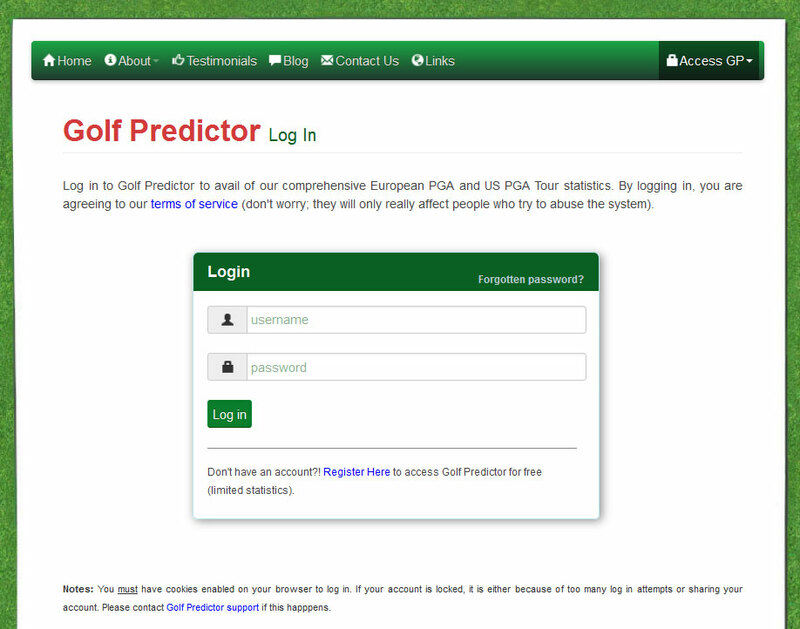 Because of this, the golfer prediction data links on this page open up in a new browser window. If you want to return to this page, I recommend right-clicking on any other link (e.g. the tournament page link) and opening the page in a new tab/window. The number of matching results for your filter(s) is displayed above the table showing the filtered field DFS data (LHS). You can only filter the predictions and create lineups for tournaments with no results in the system (i.e. the current week's event(s) before the results are inputted). This is because the filtering functionality could be relatively resource intensive and not to be "wasted" on old tournaments! In addition, the DraftKings IDs are not available for tournaments before last week (GP week 41, the week of the 2016 Portugal Masters and the 2016/17 CIMB Classic), so the CSV export would not work. I was able to find and fix several minor bugs in the original 'Filtered Prediction Rankings' page while working on this new page! I have tested this new page on FireFox, Chrome, IE11 & MS Edge, but with 52 different filters and the addition of the lineup builder, it is possible something sneaked in through the cracks. Please contact me immediately if you experience any problems with the page. A lot of work has gone into this page, so I hope you find it useful! 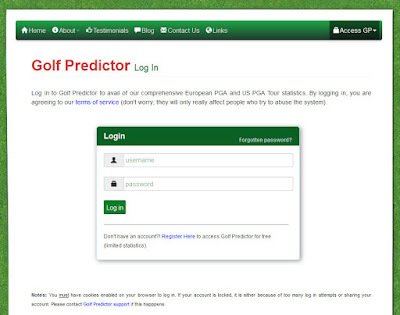 Just another way to make Golf Predictor even better! This new page is a terrific addition to the site for DraftKings users and should greatly assist you in analysing the field for an event and creating that killer lineup! You can now easily identify good picks for the upcoming tournaments using any of the 52 metrics and export your lineup to Draftkings. As this is a premium feature which will expose golfers outside those ranked 11-25 by the GP algorithm, only subscribers can filter the tournament field. Non-subscribers can access the page and create lineups for DraftKings using only those golfers ranked 11-25 by Golf Predictor, but the 'Filter' button will be disabled. 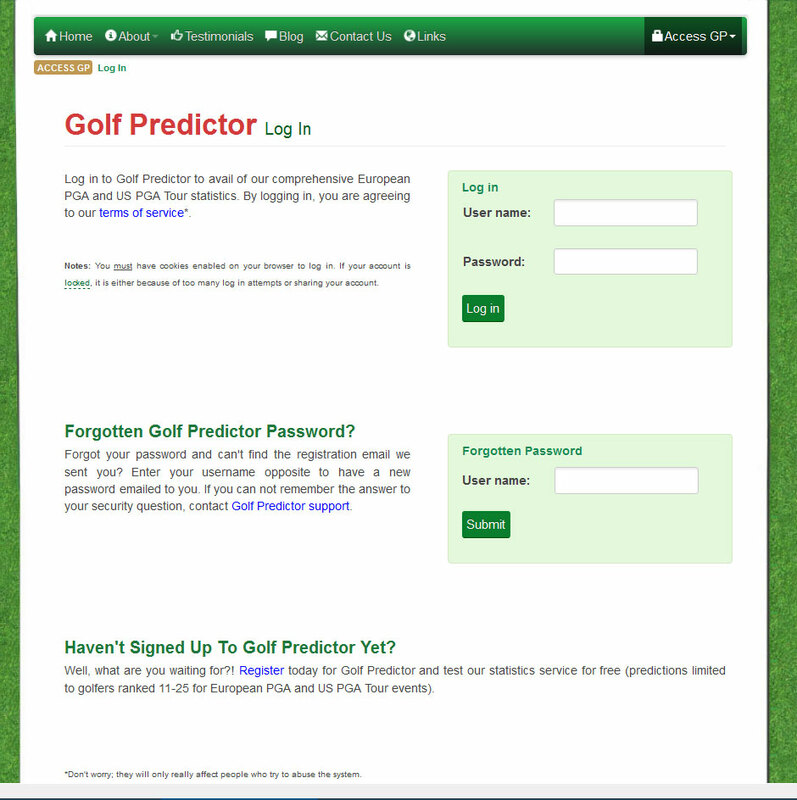 So, sign up today and reap the full benefits of Golf Predictor, the premium professional golf statistics site. *Golf Predictor is not responsible for any losses that may accrue due to any errors. The onus is on you to check your lineup. The predictions and statistics for this week, the WGC - HSBC Champions (European/US PGA Tour) and the Sanderson Farms Championship (US PGA Tour), are now available on Golf Predictor. Although world number one Jason Day isn't playing this year either, there is still a very strong field for the last WGC of the season. While fourteen of the top twenty in the world will be teeing it up in Shanghai, a second string line up will be battling it out in Mississippi. Only three out of the world's top one hundred will be playing in the event, so there is a good chance of a surprise winner! Padraig Harrington (ranked 10th by Golf Predictor) won the Portugal Masters on the European PGA Tour. The 45 year old Irishman won his first tour title in since 2008 and his fifteenth overall in Vilamoura. In a week of low scoring, Harrington made some trademark up and downs on the back nine to pip defending champion Andy Sullivan by a single shot on -23. Our top ranked player, Alex Noren, finished in tied 37th and we had only four of the top seventeen plus ties (4/21) at the birdiefest in the Algarve. Justin Thomas (ranked 9th by Golf Predictor) won the CIMB Classic on the US PGA Tour. The 23 year old American successfully defended his title with another impressive display in Malaysia. Except for a blip on Saturday, Thomas played some great golf on Sunday to win by three from Hideki Matsuyama. Thomas had some help though, as another course specialist Anirban Lahiri threw away a commanding three shot lead with a calamitous quadruple bogey on the third hole. The Indian never recovered and Thomas never looked back, easing to his second win both here and on tour. Our top ranked player, Adam Scott, finished in tied 10th and like last year, we had ten of the top seventeen plus ties (10/20). The predictions and statistics for this week, the CIMB Classic (US PGA Tour) and the Portugal Masters (European PGA Tour) are now available on Golf Predictor. Like the past few years, the Kuala Lumpur Golf and Country Club, the home of the Maybank Malaysian Open on the European Tour for the past few years, is hosting the US Tour. As most of the field is from the US Tour, course history from the European Tour events is not much of a factor. There are a few big names in the Malaysian event this year, so it should make for a good week of golf on the US PGA Tour. The field in Portugal is more modest, but there are a significant number of the bigger regulars on European Tour playing in the Algarve. Alex Noren (ranked 1st* by Golf Predictor) won the British Masters supp. by Sky Sports on the European PGA Tour. The 34 year old Swede continued his impressive form by claiming his third title of the season at The Grove. After a great start, Noren faltered around the turn and let the chasing pack back into contention. However, he was able to steady the ship and finished strongly with a closing birdie to win by two shots. Noren was our top ranked player with the withdrawal of Danny Willett, and we had eight of the top eighteen plus ties (8/21). Brendan Steele (ranked 20th by Golf Predictor) won the Safeway Open on the US PGA Tour. The 33 year old American won his second tour title by a single shot from Patton Kizzire. Steele, who let victory slip here last year with a poor final round, redeemed himself with a strong three birdie finish which set a target Kizzire just could not match. Our top ranked player, Paul Casey, finished in tied 3rd and in a tournament traditionally hard to predict, we had eight of the top twenty plus ties (8/21). *Our top ranked player, Danny Willett, pulled out, promoting Noren to the top rank. The predictions and statistics for this week, the Safeway Open (US PGA Tour) and the British Masters supp. by Sky Sports (European PGA Tour) are now available on Golf Predictor. It's the first event of the new 2016/17 US PGA Tour season, but there not many big guns trying to get their new campaigns off to a flying start. Excitement was mounting for the latest return of Tiger Woods, but he has withdrawn due to the fragility of his game. Like last year, the field in England is modest and the tournament has moved to The Grove, which won't make forecasting it any easier! Tyrrell Hatton (ranked 20th by Golf Predictor) won the Alfred Dunhill Links Championship on the European PGA Tour. The 24 year old Englishman won his maiden tour title with an impressive display in Scotland. Leading by three overnight after a course record equalling 62 on the Old Course, a delighted Hatton played impeccably on Sunday and was never threatened. With a closing 66, he tied the tournament record score of -23 in a seemingly nerveless display. Our top ranked player, Danny Willett, missed the cut, but we had eleven of the top eighteen plus ties (11/24). Brandt Snedeker (ranked 1st by Golf Predictor) won the inaugural Fiji International on the European PGA Tour. The 35 year old American hot favourite won his first tour title with a comfortable victory in the South Pacific. Leading by three overnight, Snedeker continued his good play after last week's Ryder Cup and won by nine shots in the end. Despite the windy conditions, the American went 49 holes without a bogey at one stage during the tournament. Snedeker was our top ranked player and we had thirteen of the top twenty one plus ties (13/23). There was no event on the US PGA Tour this week as it is the short close season. The predictions and statistics for this week, the Alfred Dunhill Links Championship and the Fiji International (both European PGA Tour), are now available on Golf Predictor. There is no event on the US PGA Tour this week as it is the short close season. However, after the excitement of the Ryder Cup, the European PGA Tour rolls on with the celebrity fest and an exotic new tournament this week! While there aren't many big golfing names teeing it up in either event (especially in Fiji! ), there is a solid list of European Tour stalwarts teeing it up on the three courses in Scotland. It looks like golfers and celebrities alike have the usual difficult weather conditions for the event! The European Tour continues to move as far away from Europe as it possibly can and has outdone itself this time with the co-sanctioned event in the South Pacific! Alexander Levy (ranked 14th by Golf Predictor) won the Porsche European Open on the European PGA Tour. The 26 year old Frenchman won his third tour title in dramatic fashion in Germany. Despite opening up with 62 and 63 for -17, Levy only lead Ross Fisher by one coming up the last in the fog shortened event. The Frenchman ended up hitting his second on the 54th hole into a statue and did well to rescue a bogey to force a play-off after Fisher had narrowly failed to hole a winning birdie putt. On the second extra hole, Levy holed a great downhill long distant birdie putt to secure the title and launch into the most ebullient celebration seen on tour this year! Our top ranked player, Thomas Pieters, finished in tied 57th, but we had eight of the top thirteen plus ties (8/19). Rory McIlroy (ranked 4th by Golf Predictor) won The Tour Championship by Coca-Cola on the US PGA Tour. The 27 year old Northern Irishman capped a fantastic end to the season by banking the FedEx Cup jackpot with his second title of the play-offs. On an exciting final day, McIlroy finished strongly to tie Kevin Chappell and Ryan Moore after 72 holes. With Dustin Johnson struggling, the FedEx Cup was also on the line for McIlroy and after Chappell was quickly eliminated, he finally overcame Moore's stiff resistance at the fourth extra hole. As a consolation, Moore was named in the US Ryder Cup team ahead of Bubba Watson. Our top ranked player, Jason Day, withdrew with more back problems and we had seven of the top ten plus ties (7/14) in the restricted field event. The predictions for this week, the Tour Championship (US PGA Tour) and the Porsche European Open (European PGA Tour), are now available on Golf Predictor. Only the top thirty in the FedEx Cup rankings are playing in the US season finale this week, where several players will also be playing for the final spot on the the US Ryder Cup team. Not many big names at the European Open, where home hero Martin Kaymer and the in-form Thomas Pieters are headlining the field. Francesco Molinari (ranked 8th by Golf Predictor) won the Italian Open on the European PGA Tour. The 33 year old Italian emulated last week's winner Joost Luiten by winning his home open for the second time. Molinari finished with a 65 to hold off Masters champion Danny Willett. It was nervy stuff as Willett reduced the Italian's lead from four with six to play to a single shot. However, Molinari managed to par the final hole and win by a single shot. Willett was our top ranked player and we had thirteen of the top twenty plus ties in total (13/29*). There was no tournament on the US PGA Tour this week. * Non-finishers promote Levy into the top 29 of the GP rankings. The predictions for this week, the Italian Open (European PGA Tour) are now available on Golf Predictor. Just the one tournament this week as it's the rest week in the FedEx Cup series on the US PGA Tour. There are not many big names in Italy, but at least double major winner and last year's loser in a play-off Martin Kaymer is there with reigning Masters champion Danny Willett and a supporting cast of tour regulars. Joost Luiten (ranked 6th by Golf Predictor) won the KLM Open on the European PGA Tour. The 30 year old Dutchman delighted the home crowd by winning his home open for the second time with a great final day performance. Luiten finished with a near flawless 63 (-8) in front of a large crowd to secure his his fifth tour title. Our top ranked player, Alex Noren, finished in tied 34th, but we had eight of the top sixteen plus ties (8/19*). Dustin Johnson (ranked 4th by Golf Predictor) won the third event of the FedEx Cup play-offs, the BMW Championship. The 32 year old American continued his great 2016 form by winning his third big title of the year. It was another impressive display by Johnson, who set a scoring record of -23 in holding off Paul Casey to win by three shots. Our top ranked player, Jason Day, had to withdraw halfway through the final round with a bad back. Overall, we had ten of the top seventeen plus ties (10/19**). *Due to withdrawals, Fleetwood is promoted to the top nineteen in the GP rankings. **Due to Day's withdrawal, Snedeker is promoted to the top nineteen in the GP rankings. Alexander Noren (ranked 2nd by Golf Predictor) won the Omega European Masters on the European PGA Tour. The 34 year old Swede won his sixth tour title by defeating Scott Hend in a play-off in the scenic Swiss mountains. Noren had a two shot lead on the back nine, but was caught by Hend on the penultimate hole. However, the Swede was not to be denied his second win both of the summer and at this event and he birdied the first extra hole to take the title. Our top ranked player, defending champion Danny Willett, finished in tied 12th and in an event where many bigger names failed to perform, we had only eight of the top eighteen plus ties (8/23). Rory McIlroy (ranked 5th by Golf Predictor) won the Deutsche Bank Championship on the US PGA Tour. The 27 year old Northern Irishman won his first tour title of the year with a two shot win over Paul Casey. McIlroy put his recent putting woes behind him and a poor start on Friday to come through the field and return to the winner's circle. Despite being +4 after his opening few holes, McIlroy fought back gamely and improved each day to take the title in the worsening weather on Monday. Our top ranked player, Jason Day, finished well for tied 15th and in an event where many of the bigger names also did not perform, we had only seven of the top fifteen plus ties (7/20). The predictions and statistics for this week, the Omega European Masters (European PGA Tour) and the Deutsche Bank Championship (US PGA Tour), are now available on Golf Predictor. As usual, there is a strong field in Boston for the second play-off event, with the entire top ten in the world rankings all jockeying for position in the FedEx Cup. On the European Tour, there is also a decent field assembled for the popular track in Switzerland this week. The field is led by the next man in the rankings, world number eleven Danny Willett, who is joined by several other members of the European Ryder Cup team. Thomas Pieters (ranked 3rd by Golf Predictor) won the Made in Denmark on the European PGA Tour. The 24 year old Belgian won his third tour title with an impressive display under pressure. Seeking to secure a Ryder Cup captain's pick from Darren Clarke, Pieters needed to win to have any chance. After opening with a course record tying 62 while playing with Clarke, the tall Belgian finished with three birdies to pip Bradley Dredge to the title. Pieters gave a great display of driving and approach play under the severest of pressure and has made himself very difficult to leave out of the team. Our top ranked player, home favourite Soren Kjeldsen, finished tied 8th and we had only seven of the top eighteen plus ties (7/23). Patrick Reed (ranked 14th by Golf Predictor) won The Barclays on the US PGA Tour. The 26 year old American won his first FedEx Cup play-off event and fifth tour title in total with another solid display. After a string of high finishes this season, Reed finally got into the winner's circle, albeit with help from his nearest challenger at the start of the day Rickie Fowler. After having only one bogey on the tough Bethpage Black layout over the first 64 holes, Fowler imploded down the stretch and Reed was able to close out the win without too much pressure. Our top ranked player, defending champion Jason Day, finished in tied 4th and we had nine of the top eighteen plus ties (9/21*) in total. *Stenson withdrew, promoting Oosthuizen into the top 21 of the GP Rankings.